IF cycle helmets are effective in preventing death or serious injury in road crashes, one would expect that the road casualty record would reflect this as helmets become more common. Edinburgh has been identified by Department for Transport (DfT) surveys (Bryan-Brown and Christie, 2001) as being the city with the highest cyclehelmet wearing rate in Great Britain. Informal observation shows summer wearing rates to be in the 30-40% band, rising to 60-70% for commuters in winter. The 'official' road casualty record is based on reports from the police, using STATS19 forms, not hospital records. This means that the police must know about an incident before it can exist officially. It can be assumed that the police will learn of most road accidents that were attended by the emergency services. On the other hand, if you fall off in a back street and fracture your wrist, it is hard to imagine why you would bother to tell the police about it. So while it may be taken that fatal casualties are well recorded, and serious casualties with a high degree of completeness, lesser injuries will be underreported. This is not as much of a problem as one might expect. The casualty record may be compared to the record of cycling levels as derived by on-road vehicle counts also carried out by the DfT (the Traffic Census) (##10024). This comparison shows remarkable agreement across time. For instance, in the early 1970s the amount of cycling recorded was similar to today and the number of cyclist casualties reported was also similar to today, about 4 billion kilometres of cycling and 23,000 casualties (all severities) during both periods. However, in the early 1970s there were 380 cyclist deaths per year, while nowadays there are only about 130 per year. This reveals a pattern seen for pedestrians and drivers as well; the number of casualties per distance travelled has not changed much over the years, but the number of deaths within those casualties has fallen greatly. That is, the probability of death given injury has fallen over the last three decades. The causes of this welcome improvement are not obvious, since the fall seen for cyclists has been about the same as for drivers, despite great improvements in car design and cyclists only having begun to wear helmets significantly in the last few years of the period. The author suggests that better emergency care, calming of traffic by congestion and improved tyre design are the major contributors, but he is open to other possibilities. Returning to cyclist data in particular, it is a fact that cyclist casualties are underreported, but they must be consistently underreported across time. Otherwise it is hard to understand the agreement between reported casualties and reported cycling levels noted above. This result is not as surprising as it seems. Traffic casualties have been reported with increasing detail since the Victorian era, while cycling surveys began in 1949, so both procedures were mature by 1970. If cyclist deaths go down as helmet use goes up, does that mean helmets are saving lives? Not necessarily. As we saw above, cyclist death rates have fallen greatly since the early 1970s. Most of the fall occurred before 1985, that is, before helmets were in use in Britain. This illustrates a difficulty – there are safety improvements that happen anyway for complex reasons. How do we distinguish these natural improvements from any additional effect that might be due to helmets? A method is here proposed. As hinted at above, experience shows that all road users (except motorcyclists) are about equally affected by changes in road conditions. 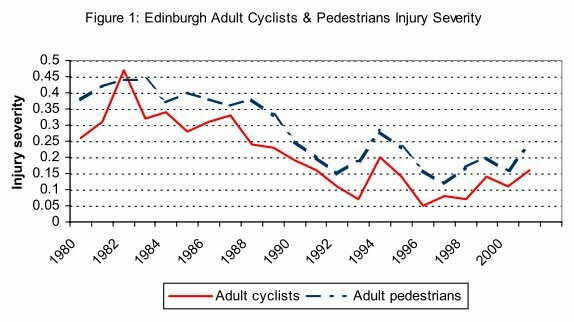 Pedestrians and cyclists follow very well matched injury trends, as the graphs below of cyclist and pedestrian casualties in Edinburgh show. As cyclist casualties are rarely older than 65 years, these have been omitted from the pedestrian data. Take a little time to appreciate how these graphs have been derived. Fatal and serious casualties have been added together and divided by the total number of casualties. This gives us a percentage. This percentage indicates the risk of suffering at least serious injury in a road accident that became known to the police. So if there were 2 cyclist deaths, 15 serious injuries and a total of 100 injuries of all kinds that became known to the police, the Severity of Injury would be 17%. In both graphs there is a high degree of correlation between cyclist and pedestrian injuries, and especially so for adults. Pedestrians suffer higher severities of injury than cyclists, both for children and for adults. For child casualties the data are more variable because the numbers involved are low. During the era before helmets were in common use, say before 1993, the injury trends of both cyclists and pedestrians improved in nearly identical patterns. That is, although the absolute changes in injuries are large, the relationship between cyclists and pedestrians is pretty constant. If we divide the cyclist data by the pedestrian data, we'd get a pretty flat relationship. This is where we might be able to observe a helmet effect if one exists. After 1993, helmets became progressively more common in Edinburgh, reaching the quite significant levels of use seen today. Can we see any evidence that cyclists have ‘got ahead’ of pedestrians in these years? It does not look like it. If anything, cyclists appear to be worse off relative to pedestrians. The matter becomes clearer if we divide cyclists by pedestrians as described above to see the relative trends (Figure 3). For adult cyclists, there is a discernible decline in relative injuries during the 1980s, which flattens out after the early 1990s, with no further improvement. There may even have been a slight decline. The history for children is again more erratic because of the small data number, but there is a decline apparent from about 1995. That is, cyclist injuries became worse relative to pedestrian injuries after 1995. 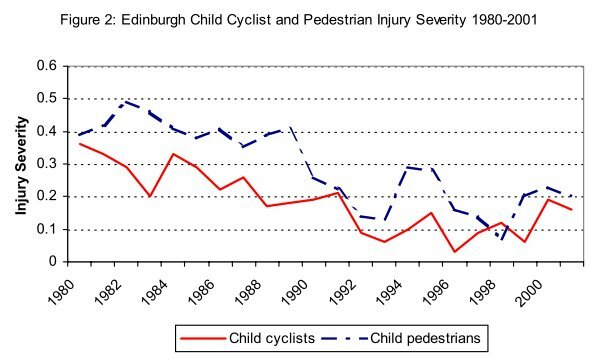 From these real world results, it would be hard to accept that the use of helmets by Edinburgh cyclists has had any beneficial impact on improving reported injury trends. For adults there was no improvement during the time of growth in helmet use, rather, pre-existing improvement came to and end, whilst for children there was deterioration for cyclists. Such a result is at odds with government policies to promote helmets to reduce reported serious casualties – and bear in mind that helmet use in Edinburgh is well ahead of the national situation. One may add this result to others: for London (LRC, 1997) , for Great Britain as a whole (Wardlaw, 2000), for the USA (CPSC, 2001) , Nova Scotia (CMAJ 2002) and Western Australia (Robinson, 1996) . It is disturbing to find yet another instance of worsening injuries with increasing helmet use, particularly as cyclists were doing better than pedestrians before helmets were an issue. Consider the following situation. You are walking along a fairly wide cliff top path, but come to a stretch only a foot wide, so that to proceed you are forced right up to the edge. Think about how that would put you ‘on edge’. Then the path widens out again and you can relax. It is the proximity of danger – or the perceived proximity of danger – that controls behaviour, to a degree that is impossible to resist for any length of time. It would require enormous self-control to amble along the very edge of a cliff as nonchalantly as if one had a clear metre of space. Now consider another situation. You are blindfolded and led along for a while by someone you trust – imagine you are gripping the back of their belt. After a time, your guide remarks you are close to the edge of a cliff, and indeed, you can hear the breakers far below. Now the pair of you stop. You remove the blindfold. Imagine your shock to discover that you have been led along the very edge of the precipice by this person you thought you could trust. That is illustration by exaggeration. Although blindfolded, you were doing just what you might have done in full knowledge; walking along the edge of a cliff. The difference was in the mood – the degree of tension or preparedness to react to an emergency. An advocate of the wearing of cycle helmets has stressed: “The argument that cyclists who wear helmets take greater risks than those who do not is rubbish… I ride safely at all times. I now feel naked without my helmet…” (BikeBiz 2003). I have no reason to doubt that this rider does nothing with a helmet on that he would have avoided bareheaded, but by his own admission wearing a helmet alters his mood – his choice of the word ‘naked’ suggests he feels less exposed with a helmet on. And it is very hard to accept that such alteration of mood will not dull reaction times by reducing the degree of tension. The difference need not be great. At 20 mph a cyclist will cover six feet in a fifth of a second. Now add the complication that this person clearly believes his helmet will provide protection far in excess of anything seen in the real world… “being led along by someone you thought you could trust”…A false sense of security is a dangerous thing. A cycle helmet is designed to prevent injury only in a simple, low-speed fall at 12 mph or less. Yet the message is so often put about that 'helmets save lives'. Could it be that this exaggeration has created a faith in the effectiveness of helmets that cannot be delivered, and the result has been to make matters worse? It has been observed that alteration of behaviour has limited the benefits of seat belt use, and put cyclists in more danger at the same time (Richens, Imrie and Copas, 2000). It is thus not implausible that too much faith in helmet effectiveness could lead to such an alteration of behaviour as to make the situation worse, not better. At the very least, it is clear that cycle helmets are not improving cyclists' reported injury trends. Butting heads over bicycle helmets. Canadian Medical Association Journal 2002;167:337-8.2002. Consumer Product Safety Commission. Reported New York Times, 29 July 2001. Road Accidents in Great Britain: the casualty report. Department for Transport, London. Various years..
Richens J, Imrie J, Copas A, 2000. Condoms and seatbelts, the parallels and lessons. The Lancet 2000;355(9201):400-3.